Chicken dishes are simply a non-vegetarians’ delight. In India, you would find chicken dishes in almost all the Indian cuisines. Well, the best part about chicken is that not only it is readily available but also it is healthy and nutritious. It falls in the category of lean meat and therefore if consumed in right quantities can do wonders to your health. Eating the food which are high in nutrition ensure a better immunity for the body and therefore all the more delightful. Chicken is loaded with loads of proteins and antioxidants which boost the immunity of the body. It also helps in maintaining the desired body weight. However, binging on Chicken Pakora would surely have an opposite effect on the body. Generally, other meats such as Lamb, Pork and Beef are rich cholesterol and saturated fat therefore they must be consumed occasionally. Besides, eating lean meats such as chicken leads to growth and development of the body. 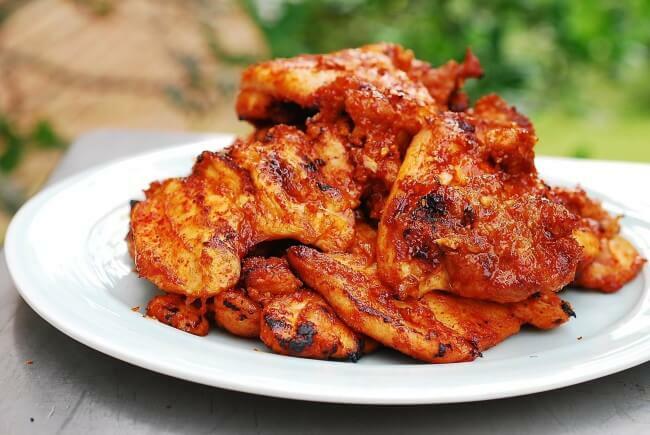 Chicken is an excellent source of iron, zinc, Vitamin B12, B6 and D. Chicken has less saturated fat than other types of meats and therefore is more beneficial to the body. Toned figure – For a muscular and toned body, have chicken as it has essential nutrients with the help of which the body functions properly. Body weight maintenance – Since it is a protein source, it helps in maintaining the body weight. It is especially helpful for people who are obese. Consuming chicken twice or thrice a week is a good idea provided it is cooked in a manner which is healthy too. Increased metabolism – The vitamins and selenium present in the chicken is in good ratio and therefore the metabolism rates increase. Immunity from Cancer – Chicken eaters are immune from cancer as chicken has niacin which protects the body against cancerous and other genetic diseases. Stronger bones and healthy teeth – The content of various nutrients in the chicken helps the bones and teeth to become stronger and sturdier. For women who have complained of bone loss, chicken is a must eat. Apart from bones and teeth, it also helps in good functioning of liver, kidneys and central nervous system. Healthy doesn’t really mean bland. While you are cooking chicken you can throw in some spices, curd, and a variety of other sauces. Occasionally Chicken pakora is also good, but most of the time, try to have a boiled, steamed, roasted and grilled chicken. Top it up with the slice of lemon and there you go! The tangy tasty and delicious chicken is ready to give you a delectable taste. Try and include the chicken breast in your diet whilst liver and kidney is also very healthy and delectable. So go for it and include more and more chicken in your diet. You would love this gastronomic experience while being fit and healthy. What Are the Top Challenges Faced by Chemical Manufacturing Industry?